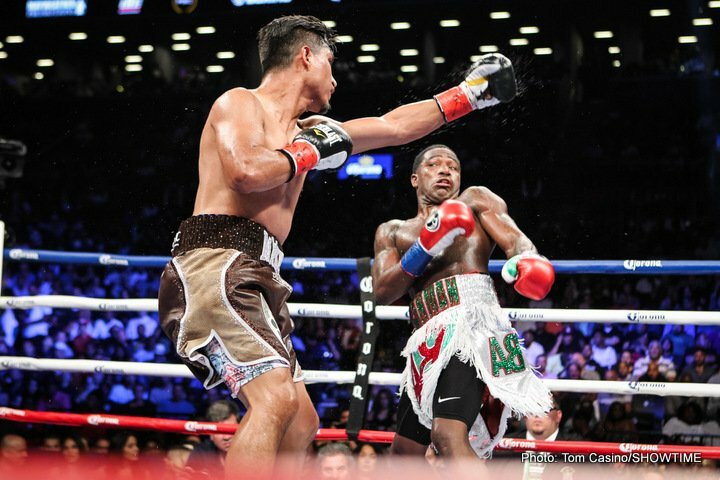 There is no denying that Adrien Broner is an extremely talented boxer. With fast hands, decent power, underrated toughness, good counter punching skills he became a four weight world champion with a decorated amateur career with 300 wins and only 19 losses. Broner is an athletic boxer with a big time camera grabbing personality and only 28 years old. With such an impressive history what would make me as if Broner can make a comeback? Broner is on the fast track to peaking at gatekeeper status; being a fighter who is formidable but not elite. Joining a list of fighters who failed to maximize their gifts, like Zab Judah, Chad Dawson and Hasim Rahman come to mind. Broner was heralded as the second coming of Money Mayweather. He was Floyd with power. Flashy and athletic, his career started great. He won titles, moved up in weight, earned main eventing shows, and backing up the talk. When Broner stepped up in class he started to challenge the elite of the lower weight fighters: Marcos Maidana, Shawn Porter and Mikey Garcia. All elite level fighters. All winnable fights. However all three of these fighters won wide decisions over AdrienBroner; even outclassing him at times. None of those guys were more talented or better boxers. However in all of these fights Broner seemed hesitant, even tentative in his approach to these opponents; falling behind early then having to attempt a late charge in attempt to catch up or garner the knockout. You have to wonder where his mind is. He seems to coast, thinking his talent will get him through. When that does not work he looks lost. Many people have asked if he is dedicated to boxing. I have to wonder that as well. Between all of his out of the ring exploits, his desire to be a celebrity, and his complete indifference to losing, I believe he boxes because it’s the easiest way to make money for himself. His reaction to losing is what is the most unsettling. He looks like he is not even bothered. Where is the fire or the competitive edge? Where is the desire to be best? Broner talks a big game, however he is yet to back it up at the highest stage. That being said, he is not a lost cause. He is still very young and very talented. If he can find his focus and turn his career around it will be a huge comeback story. But how will Broner pull that off? You cannot teach desire, passion and work ethic. Maybe a change of scenery or a more demanding trainer. Less distractions, taking the craft more seriously. As a fan of Broner, I would love to see the can man become a problem for the boxing world. You are here: Home / Boxing News / Can the Can-Man Comeback?